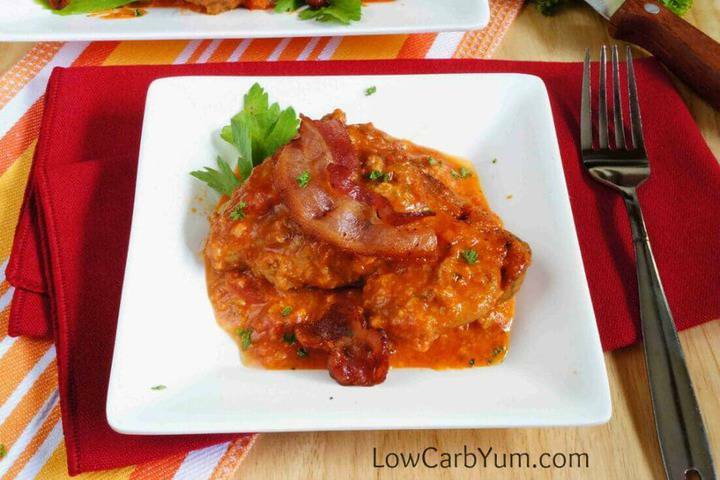 A low carb and gluten free chicken in tomato sauce recipe. 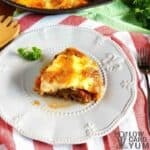 Adding cheese and bacon to the dish makes it incredibly delicious! I’ve been cooking really basic meals these days. Sometimes, I’ll just come home from work and cook up some bacon and eggs for dinner. Other times, I revert to my old standby recipes like quick cauliflower rice and chicken adobo. And, there’s always the quick salads topped with lunchmeat and cheese. It’s always so hectic in December. And, it doesn’t help that my daughter has a birthday just days before Christmas Day. This weekend, I ordered a Paw Patrol cake for my daughter as we’ll be celebrating her birthday on Sunday. I used to bake and decorate cakes for my older kids. But, I just don’t have the time for that any more. 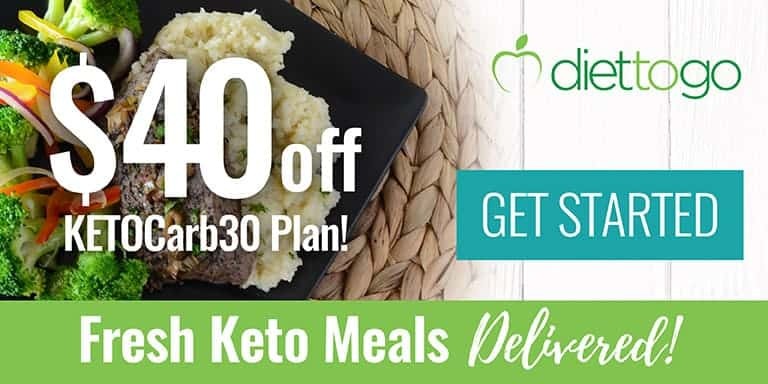 I’m also planning to bake a low carb chocolate cake and pizza casserole so I have food at the birthday party. I’ll be buying regular pizza for the celebration. As always, the holidays seem to fly by before I have the time to fully prepare. I had hoped to put together some low carb recipes for Christmas, but I just haven’t had the time. 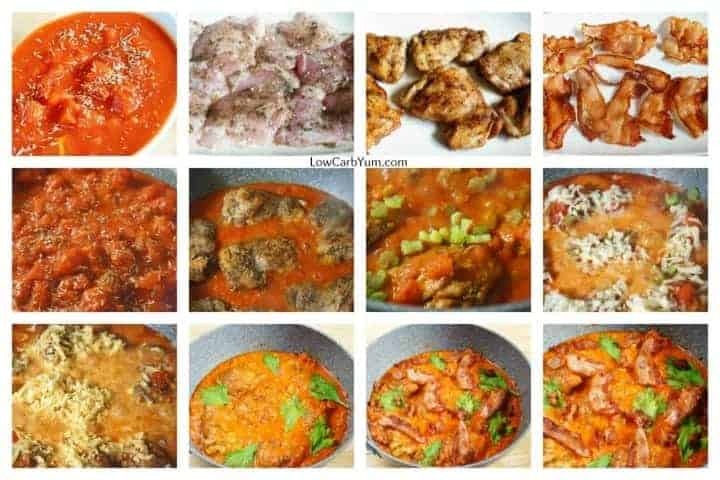 So, rather than share a holiday recipe, I’m posting this every day low carb chicken in tomato sauce recipe. 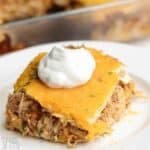 But, it’s a great dish to feed the family that doesn’t take a lot of time. If I was really organized, I would have started working on holiday recipes in the summer. That’s something I’d really like to do next year. Get more organized! It’s tough when you work full-time, run two active blogs, and have to keep an eye on a pre-schooler at home. Although blogging has brought in a nice supplemental income, it’s just not stable enough to leave my engineering job. Perhaps things will really explode for Low Carb Yum in 2017. I’ve seen a lot of bloggers do amazingly well and confidently leave their regular jobs. Maybe that will happen one day for me. So, while other food bloggers are sharing their best holiday dishes, I’m over here posting a simple chicken in tomato sauce recipe. But, it’s a recipe that you will enjoy all year long! 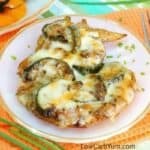 And, this basic dish has three very popular low carb ingredients. Those would be chicken, bacon, and cheese. A lot of tomato based sauces include a small amount of sugar to enhance the taste. If you’d like, you can add a little bit of Sukrin Gold or stevia. 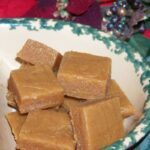 I like the brown sugar taste of the Sukrin sweetener, but stevia is a great paleo friendly option. You can also change up the cheese. I used pepper jack and cheddar, but you can use any other cheese you prefer. There’s really a lot of flexibility in this recipe. 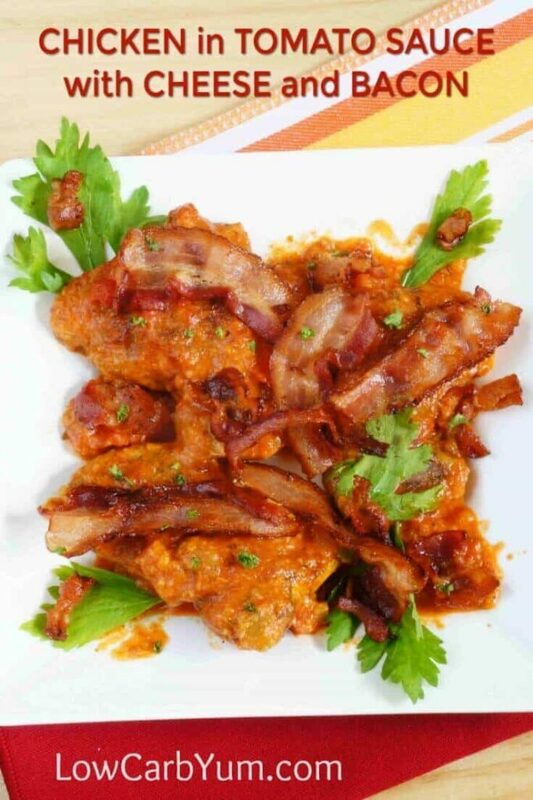 Feel free to change up the spice blend in this easy chicken in tomato sauce dish to suit your own tastes. I know a lot of people who browse recipes to get ideas. 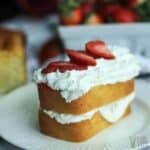 Then, they find a recipe that looks good and change it up based on ingredients they have on hand or adjust to taste. 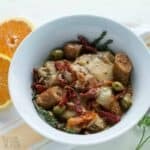 I think you’ll agree that this low carb chicken dish is a recipe that you’ll want to keep on your regular meal rotation. 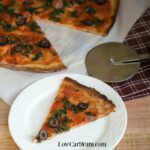 It has a wonderful blend of spices in a tangy (or slightly sweet) red sauce. 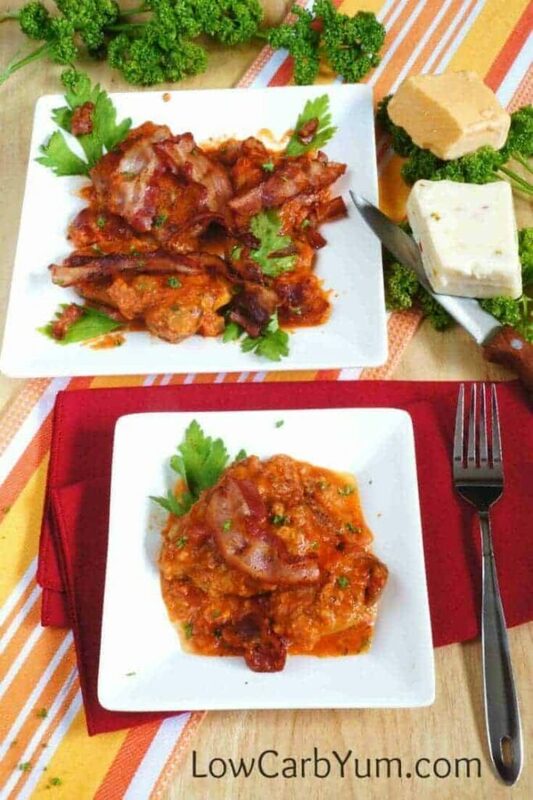 Each serving of this chicken in tomato sauce with bacon and cheese has only 5 grams total carbs. So, it won’t set you back on your goals. 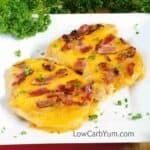 If you want another delicious chicken recipe with bacon and cheese, you must check out this popular recipe. 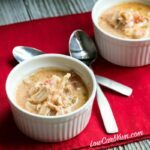 And, for something a bit more comforting, try my cream of chicken soup with bacon. 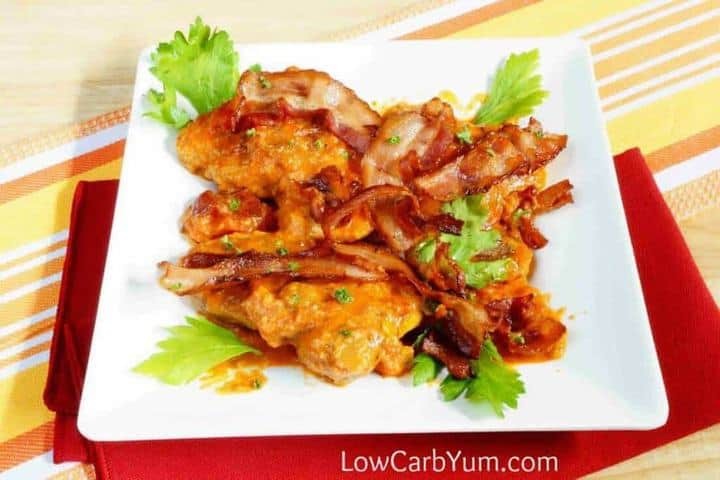 A low carb and gluten free chicken recipe with tomato sauce. 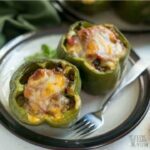 Adding cheese and bacon to the dish makes it incredibly delicious! Properly wash chicken and pat dry. Season with with salt, ground black pepper, sage and oregano. Refrigerate for 1 to 2 hours in a sealed container. Cut 7 strips of bacon into into half. The remaining 3 strips cut into bacon squares around 1 inch size. In a large skillet or deep fry pan, cook bacon without oil at low heat about 2 minutes on each side for the 7 strips cut into half. Cook the remaining bacon for 1 minute on each side. Drain. Leave bacon oil on the pan. In the same pan with bacon oil/drippings, brown chicken thighs about 3 to 5 minutes on each side. Drain and set aside. In the same pan without oil, pour diced tomatoes in tomato juice and sprinkle dried marjoram and thyme. Add chicken broth and bring to a boil for 3 to 5 minutes. Turn the heat to low then add browned chicken thighs and celery. Simmer for 5 minutes, turning chicken on the other side. Add pepper jack and simmer for 3 minutes, stirring occasionally. Add red cheddar and continue to simmer at low heat for 3 minutes. Stirring occasionally as cheese melts. 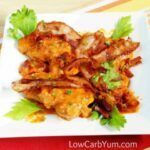 Before serving, top with celery leaves and bacon pieces around the sauce then add crisp bacon slices over chicken thighs.